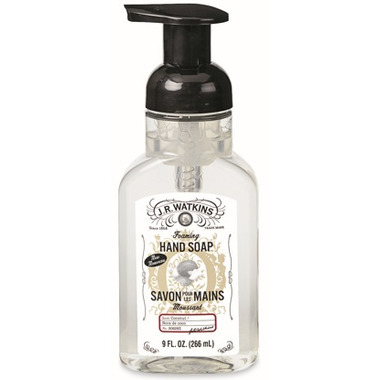 Watkins foaming hand soaps are formulated with natural ingredients and essential oils. The hard-working foams are mild and pure, and will leave hands feeling soft and moisturized, even after repeated use. Just one pump of our luxurious foam is all that is needed to clean and soften hands. The moisturizing foam in our premium hand soaps gently cleans the skin while our signature fragrances leave hands smelling fresh. Ingredients: Water, sodium coco-sulfate, glycerin, decyl glucoside, sodium cocoyl glycinate, fragrance, sodium benzoate, phenoxylethanol, potassium sorbate, citric acid. I find the smell an overpowering and unnatural coconut fragrance. The fragrance stays on hands long after cleaning. Some may find this to be a positive. Win-win: The kids love the pump and I like the pretty label. And we all love the smell! Love all JR Watkins products.